Our Asian adventures began on Sunday with the rumble of trains rattling alongside a San Francisco airport Comfort Inn, an otherwise convenient place to store a car, grab a night's sleep, and take a shuttle to the international terminal. Korean Air was our means of conveyance across the international date line. 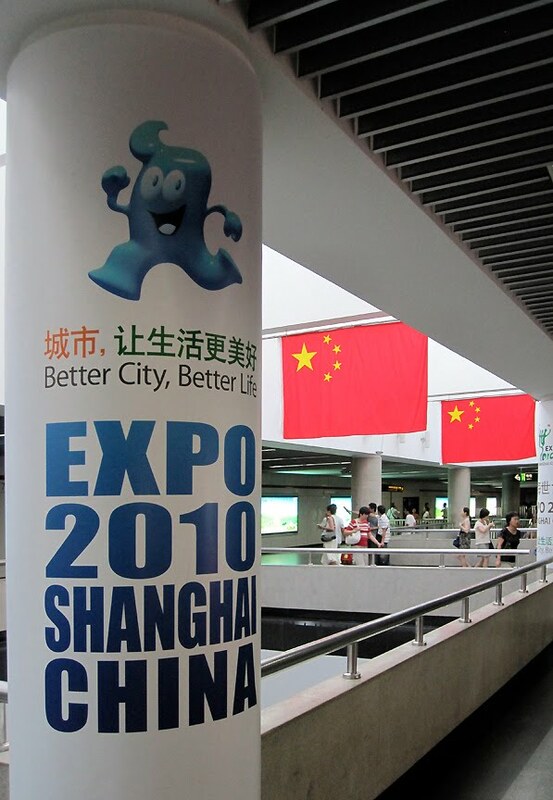 By late Tuesday evening we'd be in Shanghai - just enough time to learn not one but two languages: Thai and Chinese. Jenny, being far more diligent than I about this sort of thing, had been practicing her "Where's the bathroom?" Thai for weeks. She was really concerned about the bathrooms. Me, I'd bought a decent iPhone app, even flipped through the thing once during traffic. But the press of other commitments kept me from my studies until that flight. Jenny kindly kept her frustrations about my slacking to herself. I made up for it, I suppose, by spending much of the weekend before our flight pulling together literally hundreds of pages of information about the Shanghai world's fair, which was ostensibly the purpose of our journey. I'd focused my stress on that part of the trip, having heard from countless folks that the Fair is miserably hot, insanely crowded, and kind of a drag ("like Disneyworld - without the rides" is a popular review). I was determined that we'd have a good time. That meant searching for tips about how to organize our visit, find the best pavilions, and avoid running afoul of the many, many rules that served to remind visitors: "Welcome to China, sort of, but don't get too comfy. After all, this is China." After gathering reams of recommendations and cautionary tales, I transferred the most critical stuff into a tiny red spiral-bound notebook that I naturally called my "Little Red Book." 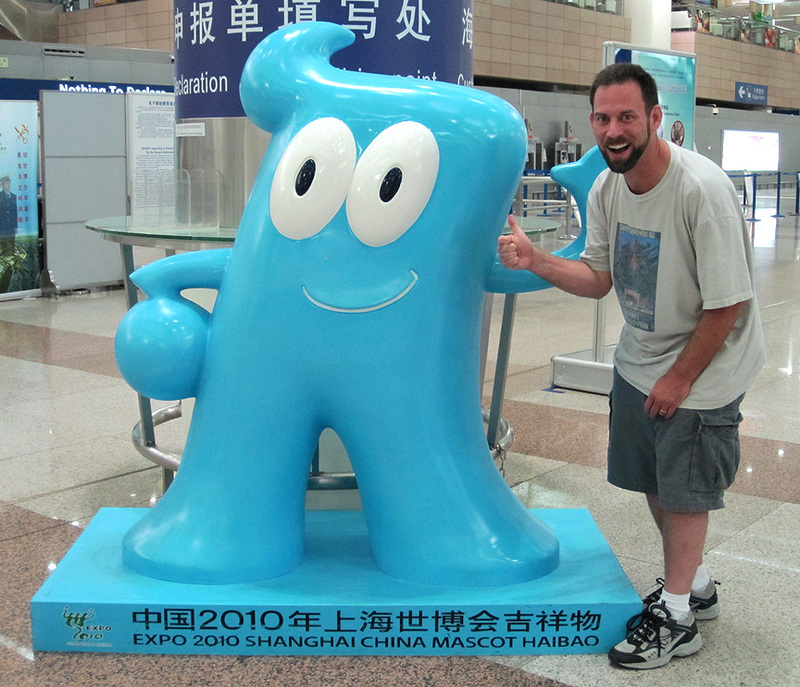 Then, a few hours before we landed, I buckled down and began my inquiries into Mandarin - only to learn that the damned language isn't just composed of different words but also different tones. That means that I could say, "How ya doing?" with friendly confidence, only to learn later that I'd announced my predilection for sheep or something. Oh, and then it turns out that Shanghai speakers supposedly use an entirely distinct dialect. Worse yet, my mental soundtrack wasn't even anything vaguely Chinese. Over and over, Murray Head's "One Night in Bangkok" ran furrows through my brain, though we wouldn't be in Thailand for another week. I was screwed. 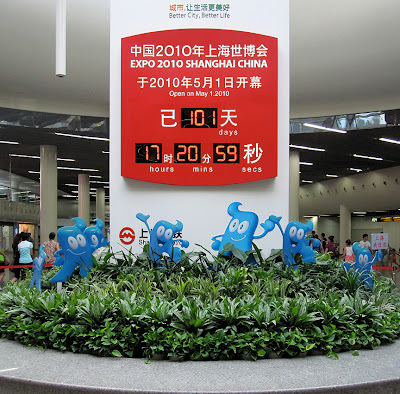 After deplaning, we cruised the travelators, passing welcome signs from Shanghai Expo mascot Haibao and mildly dreading the passport and visa drills to follow. You can imagine my thrill when I offered a cheery "zai jian" to the uniformed guy at customs and received a genuine smile in response. Exiting the baggage area, we were greeted by a guide hired by the tour group who arranged many of our activities for the trip [We don't go on "guided tours," but we have no problem paying a bit more for an expert to secure tickets and transfers, at least during a complex trip far from home]. Soon enough we'd learn the metro system, hail taxis, and even pilot a boat around a Chinese lake, but tonight we were happy to settle back for a door-to-door ride from the airport to our hotel. We were also grateful for air conditioning. Well into the night, the heat still hovered somewhere above 90 degrees Fahrenheit. 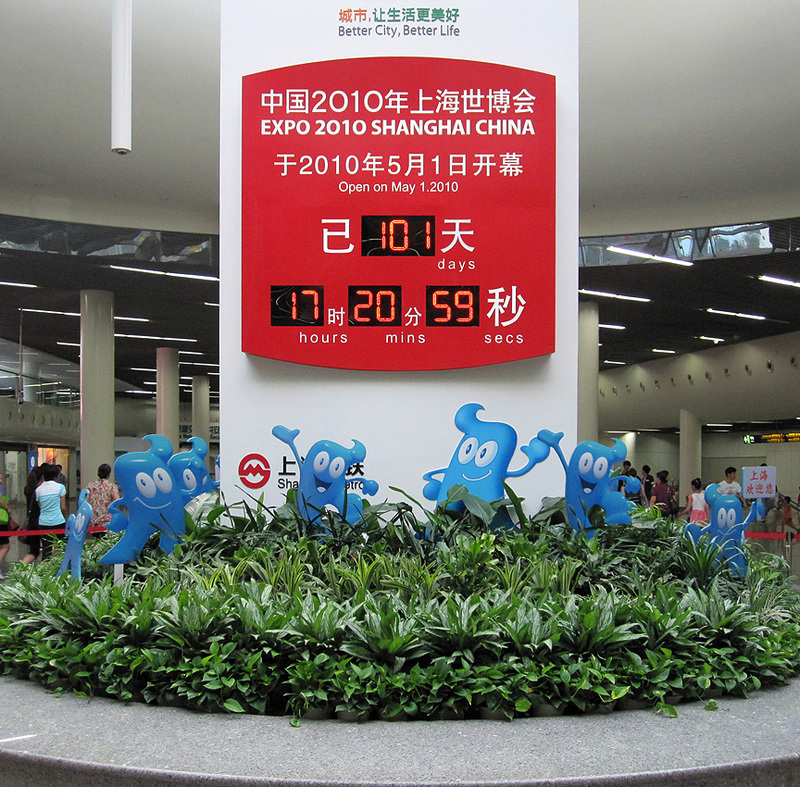 Those numbers do little to convey the heaviness of Shanghai's humidity. What's more, the smog was so thick that the clouds cast a jaundiced pall over the city's face. Driving into town, Jenny and I abandoned any pretense of reserve, oo'ing and ah'ing at the buildings' swirling animation and dazzling neon. It seemed like a child's fantasy of sci-fi movies and cartoons projected onto the landscape. As soon as we'd settled into the Hua Ting Guest House, we stared out the window at the stunning view, which included a giant Ikea sign. Safely ensconced in our room, I immediately had to leave. I flashed back on Roy Neary's line near the end of Close Encounters of the Third Kind, "I've gotta get down there." So I returned to the street level in search of a quick-stop for a cold drink. On the way, I received an invitation for a "Massage-ee?" by an attractive young woman who appeared from the darkness. Mildly annoyed and mighty tired, I could only remember the Chinese "bu," which means that I replied to her offer with a stupidly non-sensical "not!" Inside the quick-stop, an old woman was furiously stocking colas in a blessedly cold fridge. A few fell and I stopped to pick them up; she smiled, her brow sweaty from exertion, and offered a weary, "Xie xie." Returning to my room, wilted from the heat, I felt the same way. That night I dream of two porcelain-skinned Korean Air flight attendants standing like monoliths in our darkened hotel room. Wearing those eerie "Color of Perfection" uniforms, their hair tied in buns cut by sticks, the women bow in silence. See More: Check out my Asia Adventures Video! I love the video, especially that bit of Pudong at night. It looks magical. ...and you two are so cute!